The Music Biz conference launched its second day in Nashville with an awards breakfast held Tuesday (May 17), honoring some of the industry’s movers and shakers. 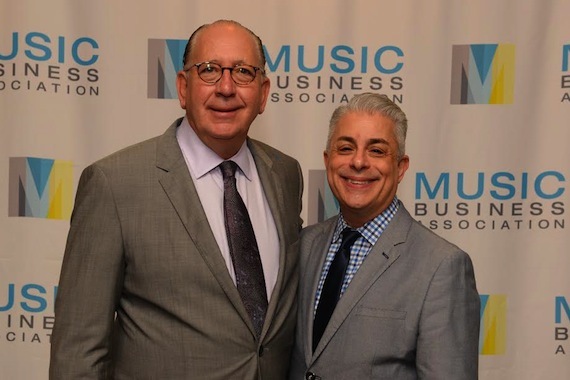 Music distribution company Redeye was honored with the Independent Spirit Award, while Warner Music Nashville Chairman and CEO John Esposito was honored with the Presidential Award for Outstanding Executive Achievement. “All I ever wanted was a backstage, all-access pass to help promote the music of these artists,” said Esposito. A video traced Esposito’s career from overseeing Harmony record stores in the 1970s, to his time working in executive positions for Mitsubishi Electronics America and Polygram, to becoming General Manager/Executive VP at Island Def Jam Music Group and President and CEO of WEA Corp. before signing on to help establish WMN, a division of Warner Music Group, in 2009. He recalled working with several of the chart-topping artists on his label’s roster, including Brett Eldredge. Esposito signed Eldredge in 2009 when he started with WMN. Esposito recalled hearing Eldredge’s demo tape and “immediately racing to dinner to meet Brett.” There, he made Eldredge his first artist signing at the Nashville label. Redeye was founded in 1966 in North Carolina by Tor Hansen, with Glenn Dicker. Today, the company has offices in North Carolina, San Francisco, Seattle, Los Angeles, Chicago, Philadelphia, Nashville, New York City, and international offices in London, Berlin, Sydney and Toronto. Country Music Association CEO Sarah Trahern welcomed guests and remarked that both the CMA and Music Biz (formerly known as NARM) launched in 1958. “We have a common goal with Music Biz of growing the music business for future generations,” said Trahern. Music Biz president James Donio remarked that the Music Biz conference’s move to Nashville for the past two years has been a profitable one for the organization, noting a 40 percent increase in engagement last year (its first in Nashville), and a 15 percent increase in attendance over last year. This year’s conference boasts nearly 1500 people representing approximately 600 businesses. Notably, Tower Records founder Russ Solomon was in the audience. Nashville mayor Megan Barry was on hand to welcome attendees and thank the Music Biz for holding its conference in Nashville. She noted the growth that Nashville has experienced in the past several years, making Nashville the country’s 25th largest city. She attributed that growth, in part, to Music City’s growing creative community. Music Biz runs through Wednesday, May 19.